Dear friends! 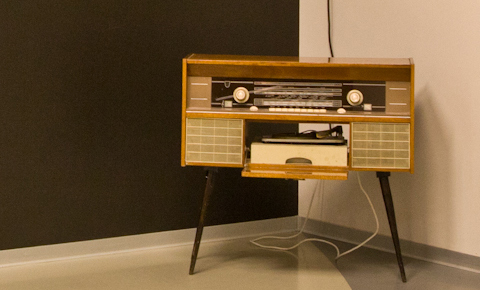 We are happy to share our great news: our radio phonograph has a history! We have recently found out that the radio phonograph on the museum fifth floor that’s been an important part of the permanent exhibition, has a long and interesting history. The enlightment came from a director and a screenwriter Nikolay Dreyden who saw it while walking around the museum after VOLKOV ManiFEST. He recognized a familiar object of his childhood — radio phonograph "Belarus" and dedicated it a lecture and a post on Facebook. We are proud that our exhibits have such a great value for our guests. The radio phonograph, that used to perform "Mamma Mia" and "Goldberg Variations", that heroically came a long way from Kiev to St. Petersburg, and that "has seen Korneychuk, Yursky and Lavrov", can be always found on the fifth floor of Erarta Museum. Don’t miss the chance to see it!